The model is available as a Python script with solution provided by GEKKO. 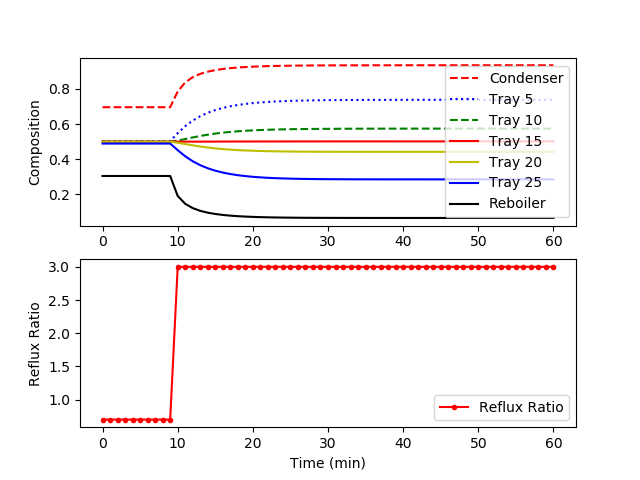 The following figure shows a step change in the reflux ratio from 0.7 to 3.0. The model is also available in the APMonitor Modeling Language. The figure below displays the system response after a step change in the reflux ratio from 3.0 to 1.5. Each trajectory represents the mole fraction of cyclohexane at each tray. The top reflux material becomes less pure (more n-heptane) due to the increased draw from the top of the column.